“Have you tried the Miracle Blanket?” one of us asked. When she replied in the negative, we accosted her with exclamations on the benefits of a tight swaddle for getting baby to sleep. 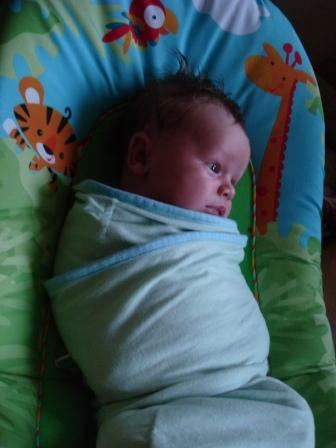 A little shell-shocked, she shared that her baby didn’t like being swaddled. Miracle blanket? Swaddle? What the heck is she talking about? For those of you unfamiliar with these lofty terms, the Miracle Blanket is a special blanket that bundles baby up so tightly that his/her arms and legs are kept from moving or escaping the tight wrap, or swaddle. This is critical during the early months when baby insists on hitting him/herself in the face for no apparent reason. When I was registering for baby stuff months ago, a friend advised that I include the Miracle Blanket in my list, though I didn’t really know why I should. I had rarely ever held a baby – much less swaddled one – so I simply didn’t understand the genius that is those magical flaps inside a long oval of jersey knit. When we brought li’l Seabass home from the hospital, our first attempt at employing the Miracle Blanket was less than impressive. We bent over the crib, frantically alternating between looking at our wailing baby and the instructions for the blanket. But he is. Swaddled is Seabass’ sleep style of choice, and thus, his Miracle Blanket is already starting to show some wear and tear. If ever it gets soiled, there is a panic in the house as to how quickly we can launder it for C’s sleeping pleasure. And we’re so cheap that we’ve only just begun to consider buying a second blanket for $39.00. Seriously, they’re that expensive. And seriously, they’re worth every penny. Oh girl, it is so awesome you are writing! I told Matt you made my day yesterday with your entries! I tried to subscribe but it didn’t work. I will try again. It is so fun hearing you write about being a mom. Crying and peeing is probably my fav so far but Murph and the cord is so classic! Thank you for making me smile and we didn’t get to have the miracle blanket with KG but swaddled her tight in receiving blankets and it was a miracle! Love you tons!! Jesus was swaddled, and it wasn’t in a miracle blanket. 🙂 Any decent sized blanket (or even a crib sheet!) will do! I can’t believe people made comments to you like that about his snug swaddling, or the fact that someone UNswaddled him. No wait, I can. I have a miracle blanket if you want it. It is pink though. Haha. But who cares if it means a happy baby, right? Hello, please pardon the intrusion. I’m Mike Gatten, inventor of Miracle Blanket. Your blog was brought to my attention because of your mention of the Miracle Blanket. (And a great job telling your story I might add!) I can’t thank you and others enough for helping us spread the word because people just don’t believe us when we tell them it might be “this easy.” That’s why word-of-mouth has been the biggest source of growth for us since day one. To show our gratitude I’d like to send you a free Miracle Blanket. Please contact Susan in Marketing and let her know what color you would like. Susan@MiracleBlanket.com or (214) 675.0539.